People have been using ginger since ancient times In the treatment of colds and flu. Luckily, nowadays ginger has even more uses when it comes to our health. For instance, people use it in the treatment of arthritis, sciatica, rheumatism, menstrual pain and many other similar health conditions. It is very simple to prepare, all you have to do is to cook half a tsp of ground ginger and 150 ml of boiling water. Once cooked, allow the mixture to cool down and then make sure to drink it 2 times per day for a whole month. First of all, take 40 grams of ginger and grind it. Once powdered, put it in a cloth bag and put the bag in a pot of boiling water. Allow it to cook for 5 minutes and remove it from the stove. After that, take a cotton cloth and soak it in the water, squeeze out the surplus water and then apply it to the painful area. In order to maintai the warmness, wrap it with a dry towel. Make sure to replace the compress every ten minutes and repeat the procedure 3 times per day. 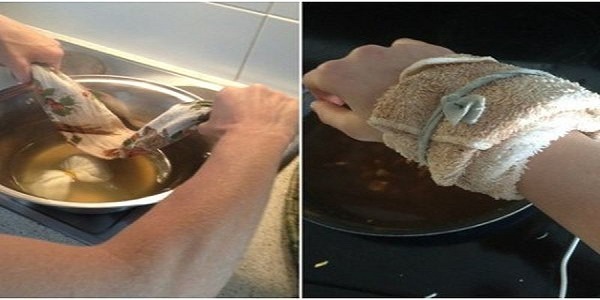 Another solution is to massage the painful areas with ginger water. This will better the circulation.